The pale pink/white sporadic flowering street trees that you see all over the South Sound right now are the earliest (or depending on your point of view, the latest) blooming ornamental cherry trees. They are Prunus x subhirtella ‘autumnalis’. At some point back in the 1980’s the “autumnalis” must have been touted by every nurseryman, garden writer and master gardener class because….the trees are EVERYWHERE! They fool you into thinking Spring is here…HA! They shoot out a few blooms in autumn too…thus the name. I’ve always wondered if growers get a “heads up” when the “Plants of the Year” are announced. Well, unless they’re on the committee, the growers read about it just like you and me. This year’s “Perennial Plant of the Year” is Amsonia hubrichtii. I questioned one of our local growers, Nils Sundquist, from Sundquist Nurseries, Pouslsbo. Nils tell me he follows the announcements like the rest of us. Also, as a good local grower, he has grown it and can pass on this advice, “t does fine here in azalea culture (bright w/ decent soil, not dry). It is fairly slug free. It breaks dormancy late. It’s polite, which is to say it doesn’t bulk up quickly but comes on steadily in the way that an azalea or heather does. It is attractive in flower and for fall foliage.” Now we know. Otherwise known as “bare root”…there are some plants you can purchase now that are so incredibly inexpensive, it’s hard to believe they’ll actually grow. They look like dead twigs with dried up roots but they’re only sleeping. They’re true survivors. Roses, berries and fruit trees are the most common and most available but you can also get unusual deciduous shrubs, trees and perennials. Naked sleeping plants are inexpensive because nurseries don’t have to spend time or extra money on containers and soil to “grow them on”. You can save from 20-70% on bare rooted plants. Planting bare roots straight into your garden soil in February and March gets them established quicker than container grown plants put in the ground a few months later. Roots in containers have to fight through growers’ soil and THEN establish themselves into your soil. Mailorder is better for more unusual varieties but give your local independent nurseries a call to see what they have available. They have the line on varieties that are better for the South Sound. The Northwest Flower and Garden Show in Seattle, Feb. 23-27, is another good source. Vendors who sell bare root trees and shrubs also have bare root perennials of hosta, epimedium and arisaemas (Jack-in-the-pulpit). Take advantage. 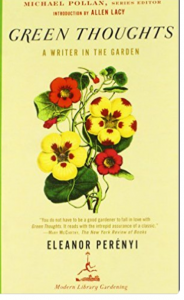 “Green Thoughts” by Eleanor Perenyi was originally published in 1981. So, the fact that it was reprinted by Modern Library says a lot. Luckily, it was not updated, just reprinted. The only change is an introduction by food activitist/avid gardener, Michael Pollan. It’s filled with essays that teach, tickle and touch. It’s perfect for this time of year. “Green Thoughts” is a sweet, quick read filled with plenty of old world charm. It slows you down and lets you enjoy some down time.